Professor Brian Roe, Ph.D., shared research efforts from a food waste collaborative to explain consumer food consumption and waste behaviors, at the Northwest Ohio Ag-Business Breakfast Forum. 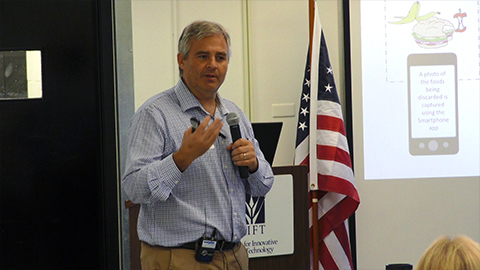 The event is hosted by the Center for Innovative Food Technology (CIFT) at the Agricultural Incubator Foundation (AIF). Food waste is a widely discussed topic in the food and agriculture industries. Dr. Roe, with background in policy issues surrounding food safety, labeling and local foods, also shared how packaging and date labels affect consumer food waste behaviors. He is a professor within the Department of Agricultural, Environmental, and Development Economics at The Ohio State University.